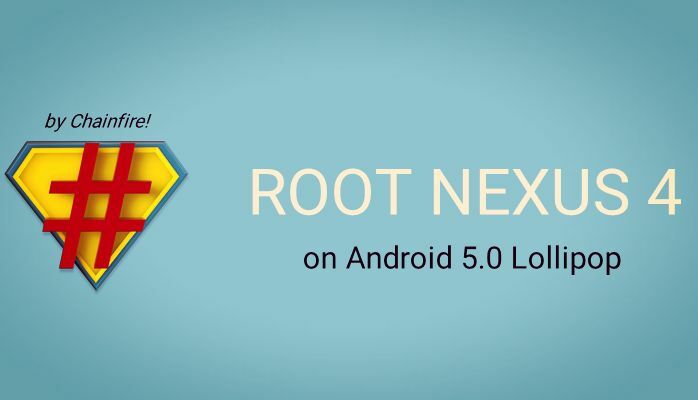 If you are the Nexus 4 user and recently update your phone with the latest Android 5.0 Lollipop firmware and looking for a easy way to root your device. Here is the complete guide which you can follow on your device and get the root access. In this guide we’ll show you how to root the phone with Cf-Auto root method, the method is very simple and take a few minutes. 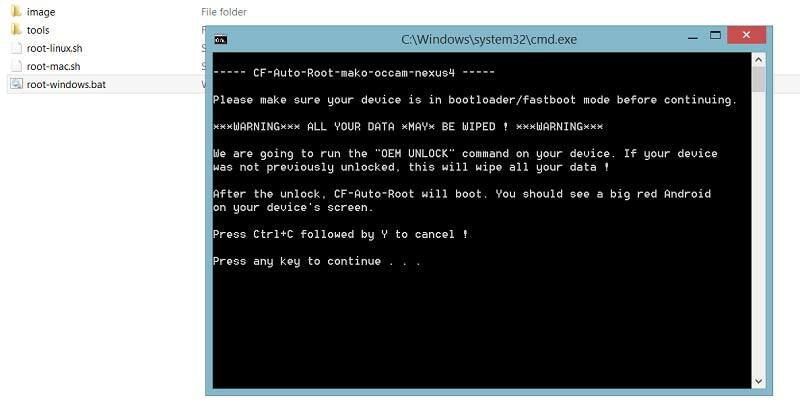 The CFAR tool is an automated script that uses the fastboot commands to root your device while you sit back and relax on your couch. One the device is rooted you can easily install the custom recovery and other rooted applications. All you have to download one file on your desktop and run the same to get the root access on your nexus 4 Android 5 lollipop. Before following this guide do take the backup of your phone and remember this will void the warranty of your phone. Step 1. First install the Nexus USB driver on your Windows desktop. Step 2. Now unlock the bootloader of your phone, if you already done this then go to the next step. Step 3. After this download the Nexus 4 CF Root file here and extract the folder on your desktop. Step 4. In the folder your will see these files and folder image (folder), tools (folder), root-linux.sh, root-mac.sh and root-windows.bat. Step 5. Turn off your Nexus 4 Android smartphone so that it can be entered in the boot loader mode. Press Volume Down + Volume Up and then press the power button to enter the device in the boot loader mode. Step 6. Once your device in fastboot mode, connect it to the pc and double click on the root-windows.bat file and follow the on screen instructions as mentioned below. Step 7. Wait for the process to complete and click any prompts on your phone that come up when asked to. Step 8. Once done, you phone will be rebooted automatically. That’s it, upon booting you will find the SuperSU app in the app drawer and your phone is successfully rooted.